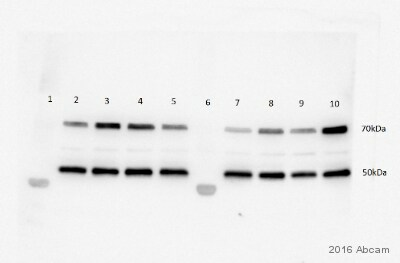 Recombinant fragment corresponding to Human CDKN2A/p16INK4a. IHC-P: Human brain tumor, ovarian carcinoma, cervix, skin and brain tissue. Rat liver tissue. Flow Cyt: HeLa cells. We have received positive and negative feedback from customers for ICC/IF. ICC/IF is not a batch-tested application for this antibody and we are not able to cover it under our Abpromise guarantee. 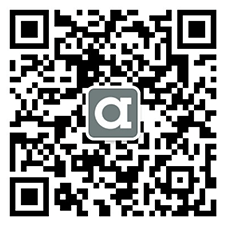 Our Abpromise guarantee covers the use of ab54210 in the following tested applications. There are 4 isoforms produced by alternative splicing. Isoform 1 also known as: p16INK4a; Isoform 3 also known as: p12; Isoform 4 also known as: p14ARF; p19ARF; ARF. Immunocytochemistry/ Immunofluorescence - Anti-CDKN2A/p16INK4a antibody [2D9A12] (ab54210)Qin et al PLoS One. 2014 May 14;9(5):e97785. doi: 10.1371/journal.pone.0097785. eCollection 2014. Fig 1. Characterization of methylation and expression of p16 in the fusion cell lines. 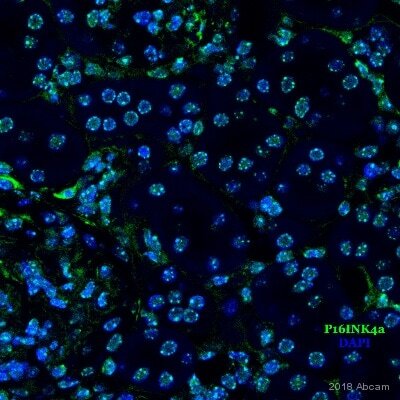 Confocal immunocytochemistry staining shows varying P16 expression in the various cell lines. Fusion cells were fixed in 4% formaldehyde/PBS for 10 minutes before a 5-minute wash in PBS. Fixed samples were blocked for 30 minutes with 0.5% Triton X-100/PBS at room temperature. 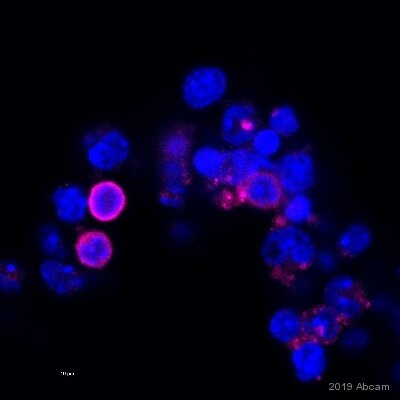 Cells were incubated with ab54210 for 1 hour at 37°C, after washed with 0.5% Triton X-100/PBS, then incubated with goat-anti rabbit IgG antibody labeled with rhodamine for 1 hour at 37°C DAPI (1∶2000) was used to stain the cell nucleus. Photos were taken on a Leica confocal microscope. 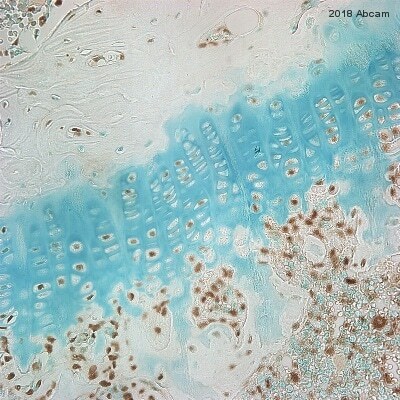 ab54210 staining CDKN2A/p16INK4a in human cervix and ovarian carcinoma tissue sections by Immunohistochemistry (IHC-P - paraformaldehyde-fixed, paraffin-embedded sections). Tissue was fixed with formaldehyde and antigen retrieval was by heat mediation in a citrate buffer. Samples were incubated with primary antibody (1/4000) for 20 minutes at 25°C. An undiluted HRP-conjugated mouse polymer was used as the secondary antibody. 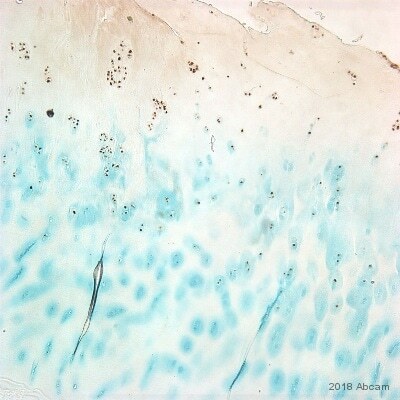 ab54210 staining CDKN2A/p16INK4a in human skin tissue sections by Immunohistochemistry (IHC-P - paraformaldehyde-fixed, paraffin-embedded sections). Tissue was fixed with formaldehyde and blocked with 2% BSA for 1 hour at 22°C; antigen retrieval was by heat mediation in a citrate buffer. Samples were incubated with primary antibody (1/100 in 1% NGS/TBS) for 20 hours at 4°C. ab6785 (1/800) was used as the secondary antibody. 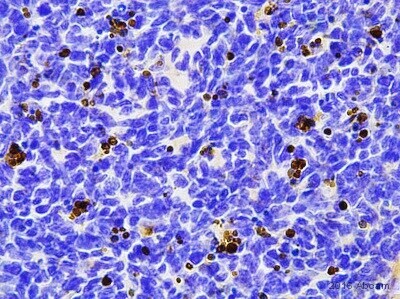 ab54210 at a 1:500 staining CDKN2A/p16INK4a in human brain tumor tissue by immunohistochemistry using paraffin embedded tissue. Nuclear staining (DAB) is shown. 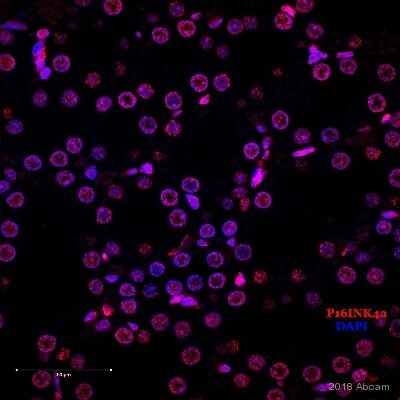 ab54210 at a 1:500 staining CDKN2A/p16INK4a in rat liver tissue by immunohistochemistry using paraffin embedded tissue. Nuclear staining (DAB staining) is shown. ab54210 at a 1:500 staining CDKN2A/p16INK4a in human brain tissue by immunohistochemistry using paraffin embedded tissue. Nuclear staining (DAB staining) is shown. 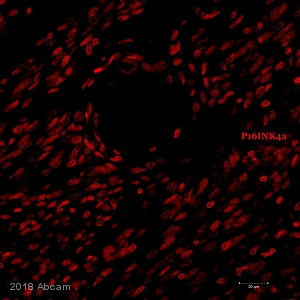 Overlay histogram showing HeLa (Human epithelial cell line from cervix adenocarcinoma) cells stained with ab54210 (red line). The cells were fixed with 80% methanol (5 min) and then permeabilized with 0.1% PBS-Tween for 20 min. The cells were then incubated in 1x PBS / 10% normal goat serum / 0.3M glycine to block non-specific protein-protein interactions followed by the antibody (ab54210, 1/50 dilution) for 30 min at 22°C. The secondary antibody used was DyLight® 488 goat anti-mouse IgG (H+L) (ab96879) at 1/500 dilution for 30 min at 22°C. Isotype control antibody (black line) was mouse IgG2b [PLPV219] (ab91366, 2µg/1x106 cells) used under the same conditions. This antibody gave a positive signal in HeLa cells fixed with 4% paraformaldehyde/permeabilized in 0.1% PBS-Tween used under the same conditions.